our unique traditional leather designers & craftsmen. With the uttermost careful attention to detail you can be assured our beautiful leather bound frames are hand crafted to the highest possible standard. Our Made to Measure calculator allows you to choose from 29 Colour's and textures, with complete control over frame width, stitching type and frame profile. If you are looking for something different or not sure what you want, then we are always happy to assist. Call our sales team direct on 0333 800 8181 or by email at sales@mirrorworld.co.uk We can work from pictures or drawings and are happy to discuss your requirements to ensuring you have a beautiful bespoke mirror. 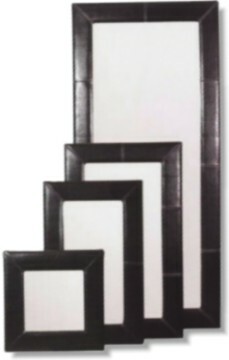 Here at mirrorworld we have and extensive range of off the shelf standard size faux leather framed mirrors, In Rich dark brown, contemporary black, sumptuous cream and tan. 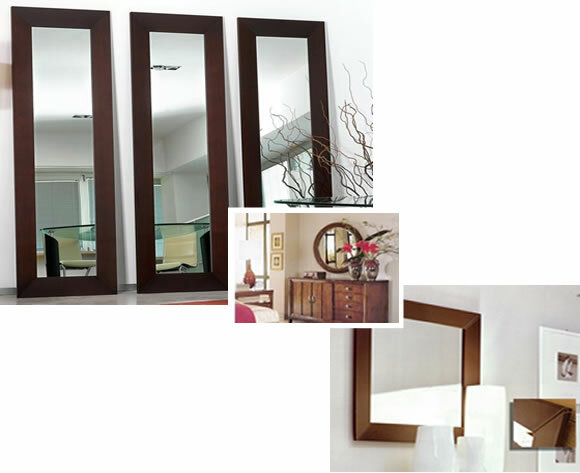 We also carry a range suede mirrors in brown, cream black and tan. Call our sales Team on 0333 800 8181 if you can't see what your looking for.